“Naiintindihan ko kayo dahil napagdaanan ko rin ang mga pinagdadaanan ninyo,” DSWD Secretary Rolando Joselito D. Bautista uttered to the gathered social workers on a humid Thursday afternoon. The secretary was visiting the region to check on the field office’s staff and facilities when he made a quick stop to the members of the Philippine Association of Social Workers, Inc. (PASWI) Cagayan Chapter who were gathered for a training to enhance their skills along social work. Secretary Bautista, himself a retired military man, is of course not a stranger to the difficulties of life in the field, traversing rivers and muddy terrains just to get to far-flung locations as much an ingredient of his army life back in the day as it is to social workers working on the field these days. He was basically saying that although comparing military work to social work is like comparing apples to oranges, the difficulty and commitment needed to accomplish the rigors of both tasks is just the same. It is one thing to have a superior that understands the difficulties of his subordinates’ jobs, it is another to have one that knows the difficulties because he himself has experienced it first-hand. On the morning of the said day, the secretary arrived in DSWD Field Office 02, 10 minutes ahead of his projected arrival, without much fanfare. He proceeded to the Office of the Regional Director for a quick change of attire then proceeded to meet with the field office management to discuss the implementation of programs and services in the region. He then went on to tour the field office units and sections with Regional Director Leonardo C. Reynoso before proceeding to launch the field office’s pair of Compendium of Feature Stories called Pagbangon and Pagsibol, meeting and commending staff while inserting a joke or two along the way. He then proceeded to talk to the field office’s employees in the multi-purpose building adjacent to the main building where he mentioned the priorities of the department for the year while thanking the staff for their commitment to work amidst the tremendous responsibilities given to the agency. He even mentioned that in one’s professional career, if a person strives to succeed and does his best along the way, then the end will take care of itself. Despite a stance that typifies an archetypal soldier with his chin up, chest out and shoulders back, the secretary can be quite jolly around people especially when he met the field office’s clients in its centers. He joyfully checked the artwork of clients from the Regional Haven for Women and Girls (RHWG) and got impressed enough that he even arranged for him to purchase one piece that he liked so much but with a catch, that he will only pay for it if it was sold to him with its fair market price, no discounts just because he is the secretary. Despite the searing heat of the sun, the secretary trudged on and next visited the Reception and Study Center for Children (RSCC) as his smile warmed the hearts of the center’s employees and clients alike. He then visited the toddlers under the center’s care and even carried some of them. He spoke fondly with the house parents caring for them and even took photographs with them. His last stop during this trip to the region was at the Cagayan Valley Regional Rehabilitation Center for Youth (CV-RRCY). He checked the facilities under construction as well as the newly-built rooms that can house center and field office visitors in the future. The secretary then spoke to the clients of the center, the Children In-Conflict with the Law (CICL), to give them advice on how to process the experiences that they had at such a young age. “Yung mga nangyari sa inyo noon, kalimutan niyo na dahil tapos na yon. Ang importante bigyan ninyo ng halaga itong pagkakataon na nandito kayo para pagbutihin ang inyong mga sarili,” the secretary mentioned. He even asked the clients who among them aspire to be soldiers one day and as the boys’ hands raised one by one, he promised to them that he will help make their dreams come true. The secretary briefly retreated to the conference area for a quick sip of a buko juice prepared by center staff while chatting with the staff gathered about the history of the center. 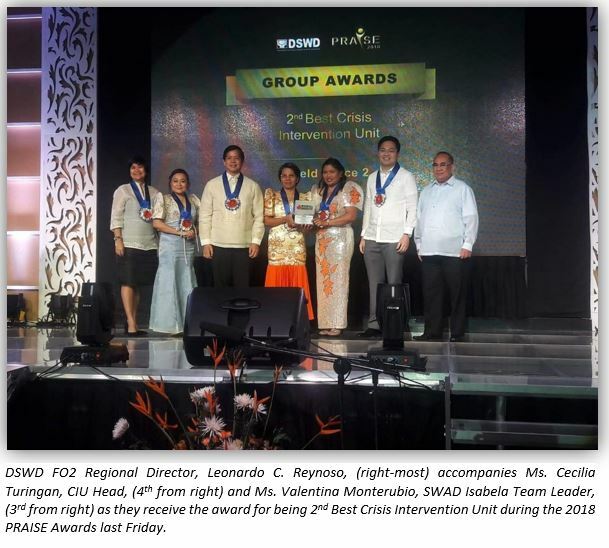 April 1, 2019 – The Department of Social Welfare and Development Field Office 02’s (DSWD FO2) Crisis Intervention Unit (CIU) bagged the award as the 2nd Best CIU during the 2018 DSWD Program on Awards and Incentives for Service Excellence (PRAISE) held at Landbank Plaza, Malate, Manila last Friday. The field office’s CIU competed in a pool composed of 17 regions and emerged as the second best after bagging the the same recognition in 2016, providing consistent and efficient service to the people that it serves throughout the years. The award was received by Ms. Cecilia Turingan, Social Welfare Officer II and Head of the field office’s CIU and Ms. Valentina Monterubio, Social Welfare Officer II and Social Welfare and Development (SWAD) Isabela Team Leader while being accompanied by DSWD FO2 Regional Director Leonardo C. Reynoso. The DSWD PRAISE Award is given to outstanding employees, individually or in groups, for excellence in their performance of functions that contribute to the achievement of the agency’s targets. The field office’s CIU won the award for its innovations in giving medical, education, burial and transportation assistance to indigent individuals and families throughout the region which include early work service, with its staff providing service to clients as early as 7 in the morning to make sure most, if not all, of the clients needing assistance are catered to during regular working hours and to prevent extending services at nightfall. The unit also provides free medical service to its clients, with a staff providing free blood pressure checkup and even the provision of medicines to treat cases of high blood pressure. The unit also has a coffee steel jug, a water dispenser and styro cups strategically located in the unit’s waiting area for clients. Two (2) televisions showing the audio video presentations (AVPs) of the field office are also placed on the unit’s waiting area for further information on the other programs and services of the field office. The field office also has strong linkages with local government units, engaging the latter on the requirements needed in the provision of assistance to clients coming from their localities before the assessment of social workers in the unit, thereby preventing cases where clients would need to secure lacking documents when they are assessed in the field office. Service transparency is also a strength of the unit, with CIU staff who verifies requirements submitted by clients positioned in front of the client waiting area so the latter can see the pile of papers going from one verifier to another, ensuring transparency and making sure that clients are served on a first come, first serve basis but with preferential treatment to Persons with Disability (PWDs), Older Persons, Pregnant Women and the like. To ensure best performance from the unit’s staff and avoid work fatigue, activities designed to relieve staff from the rigors of work are conducted on weekends to ensure that service to clients are not disrupted. With the aim of bringing services closer to the people, staff from the Crisis Intervention Unit (CIU) also joined the field office’s Information Caravan on June 2018 with the aim of bringing DSWD programs closer to regional residents. As part of the caravan, CIU staff assessed clients on site and provided with assistance after undergoing assessment without needing to go to the regional office to get the same assistance, saving both time and other resources. March 2019 marks the annual celebration of Women’s Month which from 2017 until 2022 will focus on the theme We Make Change Work for Women, with the aim of empowering women to be active contributors to development. The field office, being a social welfare agency catering to the needs of the vulnerable sectors like women, focused on conducting activities to drum up interest in the annual endeavor with a focus on events that will reach the most number of people. The very first day of March was welcomed with a radio guesting at the DSWD Dos on Air at DWPE Radyo ng Bayan where the theme was discussed along with its connection to the department’s commitment of Malasakit at Pagbabago, furthering its goal of capacitating women to be dynamic contributors to progress. A Zumba for the Department of Social Welfare and Development Field Office 02 (DSWD FO2) staff promptly commenced later that day. The activity was designed to impart to participants the idea that for real development to happen, they must be physically fit to do so while also hammering home the idea of camaraderie and solidarity. An invitation by the Department of the Interior and Local Government (DILG) on March 6, 2019 at their radio program Ikaw at ang Gobyerno Lokal: LGRRC2 on Air was also taken as an opportunity to share knowledge on the celebration as well as to reach out to the agency’s clients and stakeholders for support to the endeavor. Another radio guesting was done two days later at DSWD Dos on Air at DWPE Radyo ng Bayan where Attorney Ed Arman Ventolero of the field office’s Legal Service discussed the salient provisions of Republic Act No. 8972, otherwise known as the Solo Parent Welfare Act of 2000, including the rights afforded to solo parents. The field office also participated in the activities conducted by partner agencies and local government units throughout the month with the field office joining the City Government of Tuguegarao in its commemoration of Women’s Month from March 8 to 9 and even fielded a group of women staff from the field office to join the former’s dance competition. The field office also took part in the launching of the Philippine Statistics Authority’s (PSA) 2018 Statistical Handbook on Women and Men in Cagayan Valley last March 13, 2019 which was participated by other government agencies. An orientation was also conducted by the field office for its solo parent staff last March 15, 2019 where Regional Director Leonardo C. Reynoso discussed the Situationer of Women in the region while Atty. Ventolero held a discussion on laws centered around women like the Solo Parent Welfare Act and the Magna Carta for Women. Another part of the orientation was capacitating the participants with needed skills to be able to nurture and develop their children despite the absence of a partner, making sure that the former reaches their full potential as they grow and mature. The celebration of Women’s Month was also done in the 5 satellite offices through the Social Welfare and Development (SWAD) Teams in the provinces of Batanes, Cagayan, Isabela, Quirino and Nueva Vizcaya as well as its centers and institutions, giving their staff, clients and residents the opportunity to strengthen their bond and spend quality time. As part of the above-mentioned endeavor, a Symposium on Women’s Rights and Republic Act No. 9262, otherwise known as The Anti-Violence against Women and their Children Act of 2004 was conducted for Regional Haven for Women and Girls’ clients. Pieces of wood, chisel, hammer and other carving tools, these are Tatay Mario’s constant companion to get by. His hands show the scars as badges from his years of carving. He patiently uses pieces of wood as his canvass and meticulously carves every single detail of his masterpieces. Mario G. Namaggo, an emigrant from Ifugao Province, resides in the coastal town of Sta. Ana, Cagayan. His childhood memories would always remind him of a life of poverty, albeit one that he actively fights to be liberated from. The Municipality of Sta. Ana is situated in the north easternmost point of Luzon. The community prides in their pristine beaches, lush slopes and abundant marine resources. It is even tagged as the Boracay of the north for its world class shorelines. The Cagayan Economic Zone Authority (CEZA) is also situated in this locality where most of its commercial and industrial activities take place. The livelihood opportunities are a mixture of agricultural and commercial. Its main produce are seafood, lumber, rice and corn. Majority of the locals are fisher folks who rely on what the sea can offer. Tatay Mario married Nanay Maribel in 1995 and proceeded to build a family. The couple was blessed with six children. Soon enough the couple felt the struggle to provide for the needs of their growing family. During that time, Tatay Mario worked as a wood carver under a private employer. He only earned on a percentage basis depending on his contract with the employer. Their fate was even tested when the business of his employer went bankrupt and left Tatay Mario unemployed. To meet ends, Nanay Maribel was forced to peddle vegetables, fish and snacks in their neighborhood. To be of help, Tatay Mario collected drift wood, transformed it into souvenir items and sold it. Day and night he relentlessly worked for his family without minding his physical agony of being differently abled. 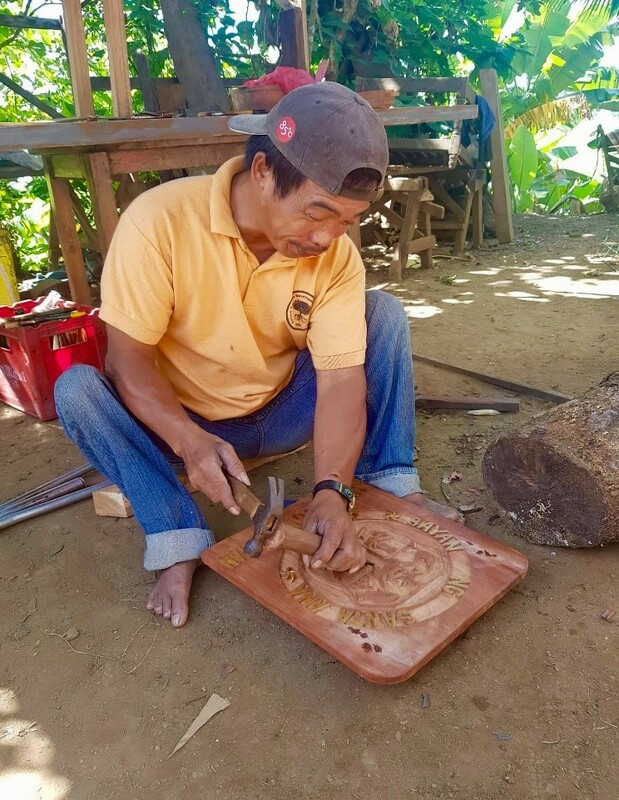 To make the most out of the skill of Tatay Mario, the family decided to accept orders and venture in furniture making and wood carving. Since 2013, they continued with the said venture despite meager revolving fund and minimal tools to work with. the couple earns an average of P5, 000.00-P6, 000.00 per contract. On labor alone, the couple earns an average of P3, 200- P6, 000.00 per contract. The steady income supports their children which they struggled to provide before. Apart from that, their learning on BLT enhanced their know how on managing their business. The couple has now been able to expand their furniture shop and has acquired additional assets such as a wood cutting machine and a curving machine. They also purchased a kolong-kolong (transport service) to reach a larger market and cater to the demands of their clients outside the municipality. More than the expansion of their business, the couple takes pride on being able to send their eldest child to college, something they consider their greatest achievement yet. Now, they have the very first degree holder in the family, a licensed teacher that fulfilled Tatay Mario and Nanay Maribel’s dream. Their daughter is currently teaching in San Vicente Elementary School. She is now helping the family especially in the school needs of his five siblings as a way of giving back for the sacrifices of her parents. Natural and man-made calamities are chilling. When nature strikes, we are at the mercy of the catastrophe that it dishes. Calamities are but normal but without vigilance, properties, sources of living and even life can be taken away. Our best preparations can go a long way towards helping us overcome tragedies. Challenges are but a part of living and problems mold us into becoming stronger and more determined. We surely develop more hope through trials and struggles. While living through these, there are people and organizations always able and willing to help. These are the moments that enable us to continue moving forward again. Lilibeth Capa, a resident of Aridawen, Sta. Teresita, Cagayan and a member of the Agta group, is one of the beneficiaries of the Department of Social Welfare and Development’s (DSWD) Emergency Shelter Assistance (ESA) for Typhoon Ompong. Her family was heavily affected and never knew how they will get to stand again after the devastation caused by Ompong. Their shelter made of light materials were all but ruined and many of their things were damaged. Their shelter, which was slowly built through years of hard work, was heavily damaged after just a night of battering from the typhoon. Even their livelihood, selling rattans, was affected from the effects of the storm. “Idi ipigsa na iti angin nan, imyan kamin dyay evacuation center, idyay iskwelaan nga asideg kanyami. Intugot mi dyay dadduma a gamit mi, ken dagidyay nabati ket inabbungan mi lattan iti tulda. Duwa rabii kami nga nagyan dyay evacuation center, idi agsubli kamin dyay balay awanen ti naabutan mi. Naperdi tay balay mi ket haanen mabalin a pagyanan, (When the winds blew stronger and stronger, we decided to move into the evacuation center, in a school near our house. We brought some of our things while we left most covered by a tolda (flat tent). We stayed in the evacuation center for two nights, when we came back, everything we left was damaged. Our house was destroyed, and we could not stay there anymore)” Lilibeth said. Edwin Capa, her husband, had at times found it hard to climb steeps after the typhoon to get rattan, their primary source of income, but he continues to push through given that the endeavor is their biggest source of income. Together they have six children, but poverty caused only one of them to reach secondary level and the rest didn’t finish their elementary education. Two of their children are already married. “Idi malpas ti bagyo, haan mi ammo nu kasano kami pay makarugi ulit, pati kar-ruba mi naperdyan met laeng, awan pagalan kanen mi ken awan ti naumno a pagturugan. Tatta nga nakaawat kamin ti tulong ti gobyerno, isu ti usaren mi a pangpaurnos ti balay, (After the typhoon, we had no idea how we could start again. Our neighbors suffered the same faith as many of their properties were ruined also. It was so hard to get food and we didn’t have a proper place to sleep. Now that we have received an assistance from the government, we now have the means to be able to repair our house)” Lilibeth added. The family of Lilibeth Capa is one of the beneficiaries of the ESA who was given assistance for the repair of their house. The family received their assistance last March 14, 2019 at the field office’s multi-purpose building. The program assists in the shelter repair of typhoon beneficiaries wherein P30,000 cash is given to typhoon victims with totally damaged houses and P10,000 for the families with partially-damaged houses. “Dakkel a katulungan kanyami dyay kwarta ta isu ti pagpaurnos mi ti balay mi, sukatan min ti semento dyay plywood tapnu haantun nalaka a maperdi nu adda man umay a bagyo, (The cash that was given to our family is a big help as we will use it to rebuild our house. We will use cement rather than plywood so when the typhoon comes, it will not be easily damaged)” Lilibeth said. 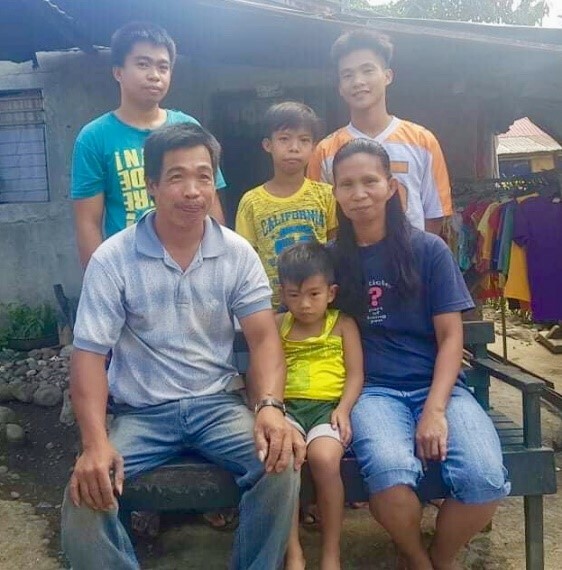 Lilibeth knows that the amount given will not be enough to fully repair and restructure their house, but she knows that the assistance given is the first step towards realizing a house that is structurally sound and able to withstand typhoons. She also knows that her family can sleep more comfortably now that the assistance is ready for them to use for repairs. Lilibeth says that having the assistance to start doing repairs have emboldened her family to start striving not just to rebuild their home but to also rebuild their life to provide a better future to the kids that are still under her care. Every March, the Department of Social Welfare and Development Field Office 02 (DSWD FO2) joins the nation in celebrating Women’s Month as part of Proclamation No. 227 s. 1988, providing for the observance of the month of March as Women’s Role in History Month. The theme “We Make Change Work for Women” was used in 2017 and 2018 and shall also be used this year until 2022. The theme aims to highlight the empowerment of women as active contributors to development. As part of this year’s activities, women from the field office were asked about their take on women empowerment and what they think are the gains that were already achieved and the development that they hope to see in the future. Janet M. Tuppil, 23, an Administrative Assistant working for the Protective Services Division of the field office, says that she is confident that she can exercise her rights as a woman through laws such as RA 9262, also known as the Anti-Violence Against Women and their Children Act (VAWC) of 2004, while also hoping for more education towards men in the grassroots to be more aware of these laws. Like other women, she says that she already experienced being cat-called which she says was unpleasant and downright terrifying. “Masaya ako dahil sa mga opportunity na ibinibigay sa amin at dahil na rin sa mga batas na meron para sa proteksyon ng mga babae. Sana magkaroon pa ng maraming orientation lalo na sa mga kalalakihan para malaman ang mga batas na ito kasi ako, nasubukan ko na ring ma cat-call at hindi maganda sa pakiramdam,” Janet said. Nancy V. Mateo, 42, single and working as a staff for the field office’s Accounting Section, says that her confidence to build herself up does not depend on anyone and she says that she continues to pursue personal and professional growth despite being single for the bulk of her life. “Ako ay halimbawa na posibleng maging independent at makamit ang mga pangarap kahit na mag-isa. Hindi palaging kailangang may kasama o katulong para maging successful,” she says. Jonavie N. Canlas, 40, working for the Records Section of the office, says that she has grown accustomed to supporting her two kids for the past six years. She says that her experiences for the last 6 years galvanized her into becoming an independent woman. Joylalyn T. Leones, 30, an Administrative Officer at the Financial Management Division of the field office, says that she appreciates the fact that she has a say in the decisions made for her family and that she and her husband take shared responsibilities in everything they do. She credits these through a society that is now more aware of the rights that should be bestowed to women. “Sa mga desisyon, masaya ako na binibigyan ako ng tsansa ng asawa kong magsabi ng aking saloobin, lahat ng mga desisyon sa pamilya ay dumadaan sa akin. Ganoon din sa trabaho, nakikita ko ang pantay na pagtrato sa mga lalaki at babae,” Joylalyn said. For some, pushing for equal rights also mean learning how to do the jobs that most people think should only be done by men. Kathleen G. Manuel-Semania, 29, an Accounting staff of the field office, said that she had to learn how to drive and even change tires to help her husband in the day-to-day responsibilities in their house. “May mga strengths and weaknesses ang mga lalaki at babae pero hindi ibig sabihin ay hindi kayang matutunan yung mga ginagawa ng mga lalaki. Natuto akong mag-drive para kapag hindi magawa ng asawa ko ay ako nalang. Pati pagpapalit ng gulong alam ko na rin,” Kathleen mentions. When Mischelle A. De Yro started working and had to be assigned to a job mostly reserved for men, she heard chatters from other people questioning her ability to handle the job. She heard how people sometimes associate women with stereotypes like tending to children and staying at home to do household chores. “Kapag may mga activity sa ibang lugar dati, may mga nagtatanong at nagugulat kung bakit ako nandoon kasi nga panglalaki yung trabaho ko. Pero pinakita ko sa lahat na kaya ko rin lahat ng kaya ng mga lalaki,” she said. Mischelle, now 30, considers the development of women’s rights through laws and other endeavors as a necessity to further push for equality between men and women. She also says that she sees equal rights now that she’s working for the field office. Ms. Sheril S. Ubarre, 36, an Administrative Assistant working for the Pantawid Pamilyang Pilipino Program here in the field office said that while she is fortunate enough to land a job in the field office, she laments about the lack of job opportunities given to her fellow solo parents due to what she thinks is unfair discrimination from hiring companies. “May mga kagaya ko (solo parent) na nag-a-apply sa mga kompanya na hindi tinatanggap kasi ang tingin sa amin ay palaging nag-a-absent kasi nga mag-isa sa pag-aalaga sa anak,” Sheril laments. Sheryl, whose husband passed away when their child was only 8 months old recalls the challenges that being a solo parent presents while hoping for greater opportunities for those like her. Tuguegarao City – With the aim of recognizing the contributions of partners in the implementation of the agency’s programs and services, the Department of Social Welfare and Development Field Office 02 (DSWD FO2) conducted the Appreciation Day for Partners at Maynard’s Resort in this city last February 20, 2019. Various National Government Agencies (NGAs), Civil Society Organizations (CSOs), Local Government Units (LGUs), academes, uniformed personnel and private individuals were vested with certificates of appreciation and tokens for their work toward helping the field office in the conduct of its endeavors across multiple programs. The program is part of the regional celebration of the field office of the agency’s 68th anniversary that is scheduled from February 19 to 22, 2019. Part of the new set of priorities of the field office for this year is to fortify its collaboration with the Armed Forces of the Philippines (AFP), one of the awardees during the appreciation program, with the end goal of partnering with the latter in the delivery of services during calamities such as typhoons through the signing of a Memorandum of Agreement (MOA). The field office envisions a strengthened partnership where it can use the warehouses of armies stationed throughout the region for the storage of family food packs ready for distribution during disaster response situations. The new endeavor also wants to use the AFP’s workforce so they can be mobilized to help field office staff during response situations in the field. To this end, the field office hopes for a more efficient delivery of its services in the future. Posted on 20 February 2019. Tuguegarao City – The Adoption Resource and Referral Section (ARRS) of the Department of Social Welfare and Development Field Office 02 (DSWD FO2) recently conducted a series of activities in line with the celebration of Adoption Consciousness this February. The celebration, which was conducted from February 9 to 17 this year, aims to spread understanding of legal adoption for people to fully accept the process and to eliminate cases of simulated birth, illegal adoption, and the like. With this year’s theme “Pagmamahal Palaganapin, Legal na Pag-aampon Ating Gawin” (Spread Unconditional Love through Legal Adoption), daily quote cards were shared by the field office through social media on the success stories of individuals/parents who went through legal adoption to drumbeat this year’s theme from February 8 to 17, 2019. The field office is also currently airing its radio plug on legal adoption on one radio station per province of Cagayan, Isabela, Nueva Vizcaya and Quirino that will last throughout the month of February. 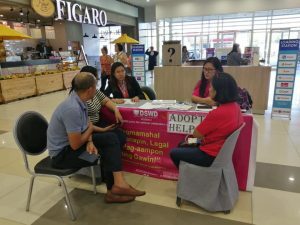 Radio guesting were also done by ARRS staff in the provinces of Nueva Vizcaya and Cagayan to spread awareness on legal adoption on top of help desks that were set-up last February 16-17, 2019 at the SM Center Tuguegarao Downtown to share information on legal adoption to prospective adoptive parents and individuals. The same help desk was also set-up in SM City Cauayan in Isabela province. 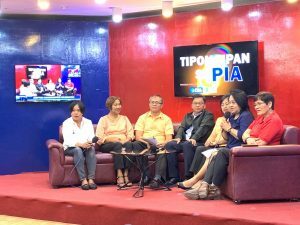 As a culmination to this year’s round of activities, Ms. Lucia Alan, DSWD FO2’s Assistant Regional Director for Operation (ARDO), Mr. Marciano Dameg of the Protective Services Division (PSD), Ms. Rosario Corpuz of ARRS and members of the Child Welfare Specialist Group (CWSG) appeared on Tipon-Tipan sa PIA on February 19, 2019 to answer questions from the media on legal adoption and foster care.